Collecting grass clippings from wide areas. Compact and manoeuverable vacuum sweepers with folding wings with an extra large bin capacity of 14 to 20 m3. Wide areas produce large amounts of grass clippings and extra loading capacity saves a lot of driving back and forth to and from an unloading point. Wide area collectors are specially designed for collecting grass cuttings from very large areas. Folding wings allow working widths from 6 to 7.8 m (20 – 25′). At a high working speed, a large wide area collector sweeps an area of 13 hectares clean in one hour. The extra large wide area collector is driven by a PTO drive shaft attached to the tractor and requires an output of The required hp PTO can vary depending on the working conditions.90 – 110 HP (66 – 81 kW). • Collects up to 13 ha per hour. • Working widths from 6 to 7.8 m (20 – 25′). 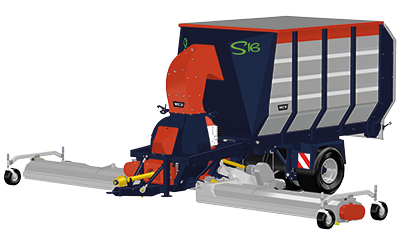 "At a high working speed, our S16 large wide area collector sweeps an area of 13 hectares clean in an hour".